Just to the southeast of the mountains surrounding the Shrine of Compassion. 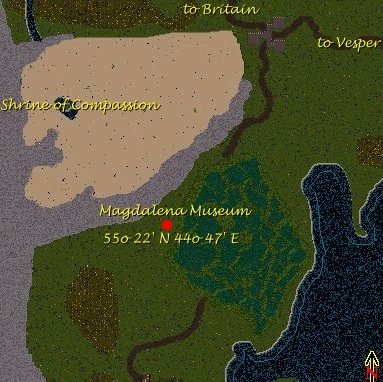 History: LdyHawke placed the Magdelena on the first night Trammel opened for housing in June of 2000. 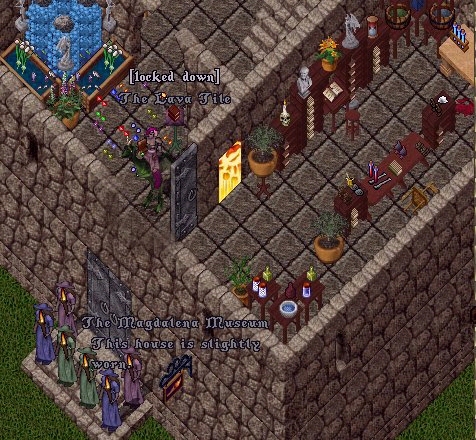 The Tower began as a guild house, but has evolved into a rares museum and vendor shop housing 13 well-stocked vendors. The Magdalena Museum houses many true rares, incorporated into the design and layout of the house. The Museum boasts the only lava tile on the shard, and a book explaining the tile’s history and origin is locked down near it. The Museum is always open and the guestbook is available for signing. LdyHawke is generally in the house between 1 PM PST and 12 AM PST if you would like a guided tour. While the house is not part of the role-playing community per se, LdyHawke remains in character as often as possible. The vendors on the porch are placed for the protection of the customers, as the nearby swamp spawn can sometimes be a problem.